Donald Trump is imploring his New Hampshire supporters to leave nothing to chance on primary day. He's telling a crowd in Portsmouth, New Hampshire, to head to polls Feb. 9, "no matter where you are, no matter how you feel." Trump continues to dominate polls in the first primary state, but is showing clear signs of anger about his second place finish in the Iowa caucuses. He's telling voters not to assume a Trump victory in New Hampshire will be a sure thing. He says he wants to come out of New Hampshire's primary with a "mandate." 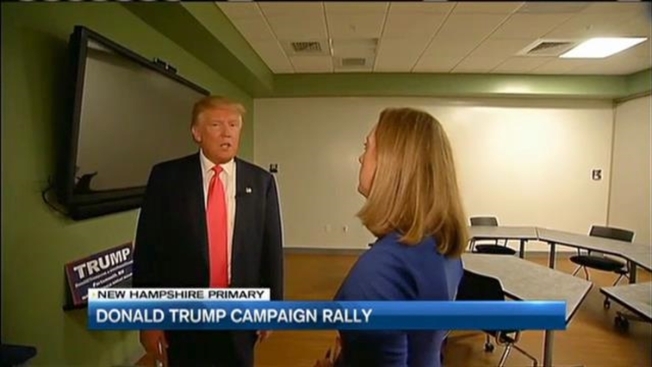 Also on Thursday, Trump gave a one-on-one interview with necn political reporter Alison King. He also spoke exclusively with Broadside host Sue O'Connell.